Most beautiful cave formation in the UK? Any shots of other stunning formations in the UK?? 3 Likes gardouth, hornbydd and benshannon like this. 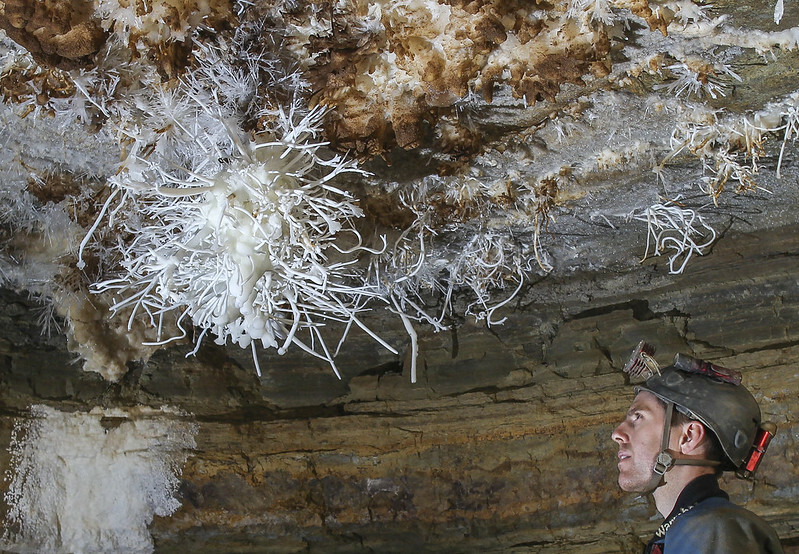 Re: Most beautiful cave formation in the UK? I know my favourite formation, it's not got a name and I bet most people don't even notice it. It's a really beautiful curtain in Charterhouse, shortly before 'The Blades' (which do have a name). I always take a moment to admire it on my way past, but have deliberately never photographed it as I'd prefer to see it in a cave than on a screen. My favourite formations are in GB cave. The little helectite hidden in the wall just after you cross the bridge towards white passage. Always stop for a look. Not the most beautiful in the UK, i admit, but i would put an argument up for Fernhill cave and the curtains that fill the passageway. I was lucky enough to get my first trip down Otter Hole last year, and was gobsmacked... after recent trips to see the amazing sights at the far reaches of Draenen, Aggie, OFD, and some of the less well visited and extremely well decorated parts of Ease Gill Caverns... I wasn't sure whether Otter Hole would live up to it's reputation, but it did not disappoint. Other locations that come to mind are GB Cavern, Glasfurd's Chamber in Gavel Pot, Shuttleworth Pot, and of course Notts II. Also, a highly biased viewpoint (as one of the discoverers), but the formations in the main streamway of Excalibur Pot are not so shabby; especially considering the grottiness you have to endure to get there! 1 Like CavefestUK likes this. : Apparently the China shop in Boreham is nice ! 2 Likes Caver Keith and PeteHall like this. There's a little seahorse formation in Midsummer chamber in Charterhouse that I love. 1 Like Pegasus likes this. School of Karst Rocks. University of NiFe. Quite possibly the spoil heap at any rapidly progressing dig. The beauty is implicit in the constant progress and discovery of new passage. 3 Likes Graigwen, maxf and PeteHall like this. 1 Like alastairgott likes this. Favourite passage....That's a whole other list! I second the arogonite formations in Urchin Oxbow in Daren, they're spectacular! I remember thinking that the Bonsai Tree itself seemed nothing particularly special _in its context_ - i.e. a streamway with miles of amazing pure white helictitic formations. Possibly I was looking at the wrong one though! It has to be The Courtesan (Agen Allwedd) for me.